An enthralling, inviting JRPG with a solid cast and enjoyable story; Deep and strategic combat system that rewards experimentation; Highly customizable job system; Excellent variety of boss fights; Unbelievable soundtrack. Over-exposition runs rampant throughout the otherwise well written script; The last few chapters bring the stories pacing to a frustrating halt; Characters sometimes fall into genre clichÃ©s. Bravely Default is an addicting, magical journey with a mesmerizing soundtrack and brilliant job system. Despite a very frustrating late-game, it excels in showing that there is still room in the industry for old-fashioned JRPGS. An excellent addition to any 3DS owner's collection. Many gamers out there today would love to tell you that Square Enix has become a monstrosity of a developer, creating great looking games with hollow characters and shallow gameplay, citing Final Fantasy XIII as the biggest offender. In continuing to push games with embarrassing writing and bargain bin story concepts, many believed Square had fallen off the saddle once and for all. I never joined in that audience of enraged fans, as I always believed “Squeenix” had good intentions and good ideas, but with questionable execution. Bravely Default has proven to me, beyond a shadow of a doubt, that the Japanese powerhouse has once again found their stride and are still more than capable of creating gems with that old Square magic. Initially, Bravely Default starts out like the most basic of Final Fantasy affairs: There are four crystals that need awakening, and there are four heroes fated to do just that. Shortly after your party is fully formed, however, Bravely Default takes a unique turn with a heavy emphasis on boss battles, side quests, and exploration. The overworld is large, featuring four distinct, sprawling continents that each hold a plethora of dungeons, enemies and rewarding side quests. In the roughly 63 hours I spent with the game, I was seldom bored, as new tasks and objectives were constantly presenting themselves. While the story initially seems rather bland, it slowly morphs into a surprisingly intriguing tale of mystery, betrayal and the exploration of morally gray decisions. While it doesn’t delve as deeply into its more somber subject matters as I would’ve liked, the story still succeeds in the end as a triumphant romp, equally full of heartbreak and laughter. The story holds up well until Chapter 5 comes into play. This brings everything to screeching and frustrating halt when the game insists the player complete a number of monotonous tasks over and over and over and over again. It’s a baffling choice in both design and narrative, and while the ending is satisfactory, I almost snapped my 3DS in two when I was asked to do the same tedious task for the third, fourth, and fifth time. This isn’t a deal breaker, but it’s a sure source of frustration that seriously dampens an otherwise fantastical journey. The characters have a simple charm about them, though admittedly fall into several genre cliches: Tiz is soft spoken and shy, but courageous when the time arises. Agnes is naÃ¯ve and sheltered, but caring and determined to help others. Edea is textbook tsundere: hot-headed and loud, but with a soft heart and strong sense of justice. Ringabel, while being one of the easier characters to fall in love with, suffers from some of the most obvious tropes: He’s a ladies man with a one track mind, recently struck with amnesia. While these characters have been done to death in similar works of fiction, there’s a certain charm about them that will have you chuckling at Ringabel’s lovestruck antics and and cheering Agnes on as she gives her all. Dialogue is fairly well written, though longer scenes can often become a serious drag to sit through. Characters have a bad habit of talking for excessively long periods of time, making even simple subject matters a test of patience for the player. The otherwise good script is drenched in unnecessary over-exposition and I could see a number of people skipping through these tired scenes with little remorse. The battle system in Bravely Default is a run-of-the-mill, turn based system with a twist: Characters can choose to either Default or Brave during battle. Choosing Default will cause the character to block for that turn while storing a Brave Point for use next turn. By choosing Brave, players can use these stored Brave Points to unleash up to four actions in one turn. Brave Points can also be forwarded, though this will cause your characters to be unusable until they have enough BP stored to make their next move. This seemingly simple addition to a mostly standard battle system adds insane amounts of depth to each and every battle you will fight, bosses in particular. Bosses are tough and require a careful watch on your resources, as well as lots of planning ahead and patience. Those that rush into a tough encounter with no strategy will quickly be pulverized and sent back to their last save, as enemies will take no time in trouncing those that are not prepared. Taking another cue from Final Fantasy, Bravely Default features a job system with 24 jobs in total. Similar to Mega Man games of old, acquiring a new job requires you to defeat the original occupation holder in battle. Most job holders are found through side quests, creating several fun mini-adventures to embark on, all with great reward. Each member of the player’s party can learn as many jobs as they want and swap between them anytime, encouraging experim entation. Jobs each come with a unique set of abilities and perks, and you can mix and match these with a surprising amount of creative freedom, offering the player near endless customization options. Playing around with jobs was one of my favorite parts of the game, and I hope to see this be a series staple as more Bravely games are released down the line. The game also features a random encounter slider, allowing players to pick and choose when they want to have random encounters in the overworld, creating a welcome level of choice when grinding. If you’re re-traversing a particularly tricky dungeon, having the option to turn off random encounters is a god send and a feature that I will sorely miss in other JRPGs. Square Enix has a history of making gorgeous games with incredible soundtracks and Bravely Default is no exception. Characters are well animated and cute, and the environments are lovingly crafted and highly detailed. 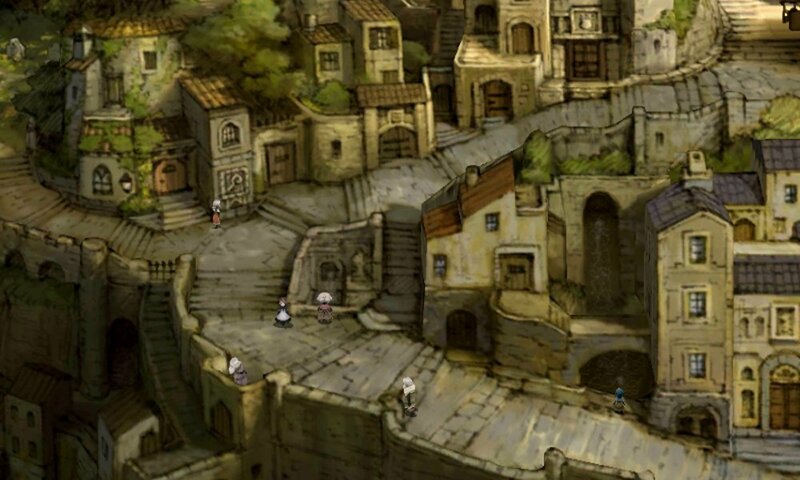 Towns look to be hand drawn, with a fantastic level of care being forced into every nook and cranny in sight. Ancheim, a desert city filled with windmills, gears, and a gigantic clock, is particularly breathtaking. The soundtrack in Bravely Default may be one of my favorite OSTs in recent memory. The song list is long and varied, expertly accompanying scenes and scenarios of varying emotions. Certain tracks will still be playing in your head long after you set your 3DS down. Occasionally, I would boot up the game, set it down beside me, and simply let the music play as I worked on other things. Great music is a very significant part of long JRPGs like this one, and Bravely Default does not disappoint. 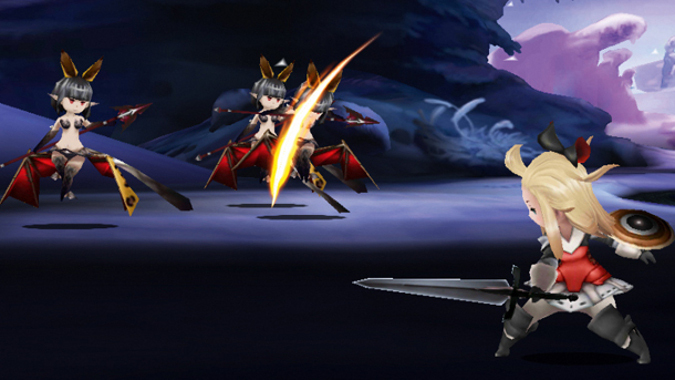 Bravely Default has an interesting take on multiplayer that I found quite refreshing. Your tasked with rebuilding the town of Norende after its destruction, but you’ll need to recruit help to do so in a timely manner. You can invite random other 3DS owners to help in the construction process using Streetpass, sending out 3 to 4 invites a day. The best part is that these other players don’t need to respond to your invitation directly, as the population of your town will increase with every invite sent. As Norende grows, you can add a number of shops, including a store that grants you special moves for use in battle. You can also build stores that sell potions or weapons, allowing you access to these items at every in-game save point. If you’re not into city building mini-games, however, you’ll be happy to know that this whole feature is completely optional. The shops will help you out in small ways throughout your adventure, but the items and special attacks are not a necessity to complete the game. Another interesting take on multiplayer is the ability to share attacks or spells with your friends who own the game. In battle, you can choose to send a particular move to someone else, which they can then use in battle at the time of their choosing. If you don’t have any friends that own the game, don’t worry: Bravely has an assortment of bots that will lend you their attacks, which can prove to be handy in a tough fight. As I mentioned before, the game is a thrill to play until Chapter 5 sabotages the pacing. It doesn’t hurt the gameplay, as the battle system continued to be great fun throughout my entire experience, but it needlessly extends what is already a lengthy game. By the time you finally reach the last dungeon, it’s easy to forgive the games’ infuriating last few chapters, but I think many gamers will set the game down before reaching that point, and for good reason. There’s no excuse for what these last few chapters do; It’s a bad story mechanic and a terrible game mechanic, period. Annoyingly long winded monologues were also a downside, bogging down scenes that could have been short and simple. Luckily, all cut scenes are skippable, though it’s sad that much of the story is communicated through these aggravating sequences. The characters are uninspired, frequently falling prey to a number of cliches typically associated with JRPGs. This won’t stop everyone from liking them, however, as I found myself to be enamored with Ringabel and Agnes by the end. Still, they could have been significantly more original, and these characters just serve as further proof that it is all too easy to create cookie cutter protagonists and call them your own. Bravely Default is an addicting, magical journey with a mesmerizing soundtrack and brilliant job system. Despite a very frustrating late-game, it excels in showing that there is still room in the industry for old-fashioned JRPGS. An excellent addition to any 3DS owner’s collection.